The windiest day of the forecast, a strong southerly flow of air off the Gulf of Mexico will prime the pump for this weekend's activities. Humidity also increases as dewpoints rise into the mid 60s on wind that gusts over 30 mph at times this afternoon. Though we haven't reached 90° yet this year (the average first 90° day is May 24), today will be quite warm with highs in the mid to upper 80s. Clouds will also slowly increase this afternoon and evening, but don't forget the sunscreen anyway if you are headed to the pool or other outdoor locations to celebrate the end of the school year or the start of the first "honorary" weekend of summer! With a ton of outdoor activities going on, fortunately most of Saturday looks to remain dry. We're watching for the possibility of a cluster of storms forming and possibly affecting the metro during the morning hours. Those may or may not happen, but keep an eye out. If lightning strikes, jump out of the pool - yikes! 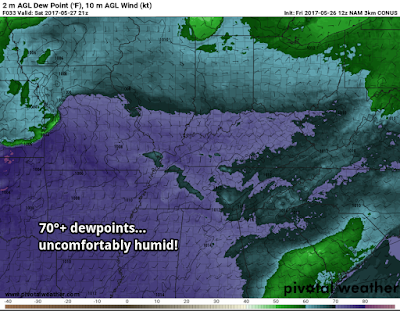 Humidity continues to rise as dewpoints cross the sweaty 70° mark and wind remains somewhat gusty out of the southwest all day. 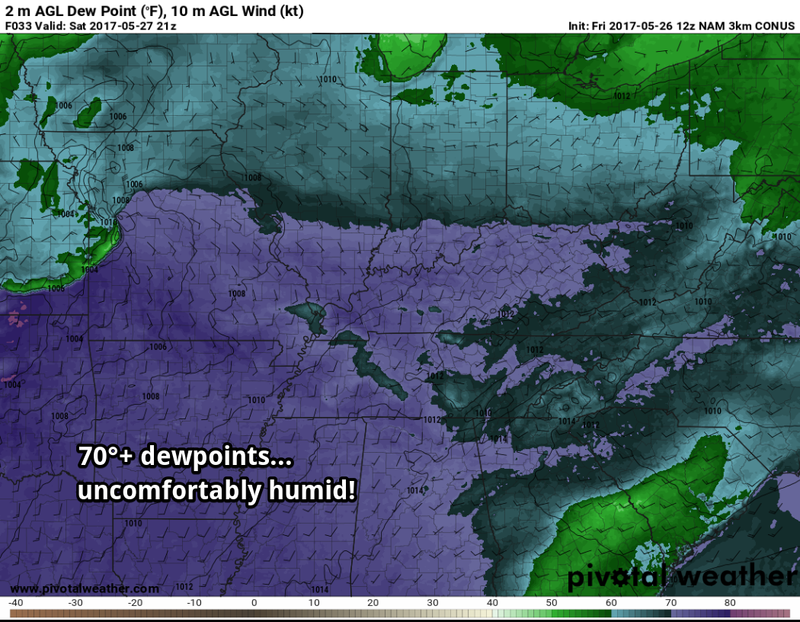 Despite temperatures reaching similar levels to Friday, a good deal of instability in the atmosphere will be "capped off" by warm air aloft, preventing thunderstorm development. Can't rule out a stray shower, but most of the afternoon and evening will stay dry. Good news if you're headed for Memphis in May's 901Fest, the Memphis Redbirds game, etc. All weather folks' eyes are on the overnight hours Saturday night as a risk of severe storms exists. Areas north of I-40 are under an Enhanced Risk of severe weather (category 3 of 5), while areas along and south of the interstate are one category lower, a Slight Risk. To our north, a Moderate Risk (category 4 of 5) is forecast for areas north of Jonesboro to Dyersburg. One or possibly two thunderstorm complexes will affect the metro, most likely anytime after midnight, though there is a risk starting about 10pm or so if the first round comes early. If you have evening plans Saturday, keep an eye on your favorite weather source(s) and be prepared to pack up and find shelter if storms come early. The threats associated with overnight storms are primarily torrential rain, dangerous lightning, high wind (above 60 mph), and possibly hail. A brief tornado also cannot be completely ruled out. 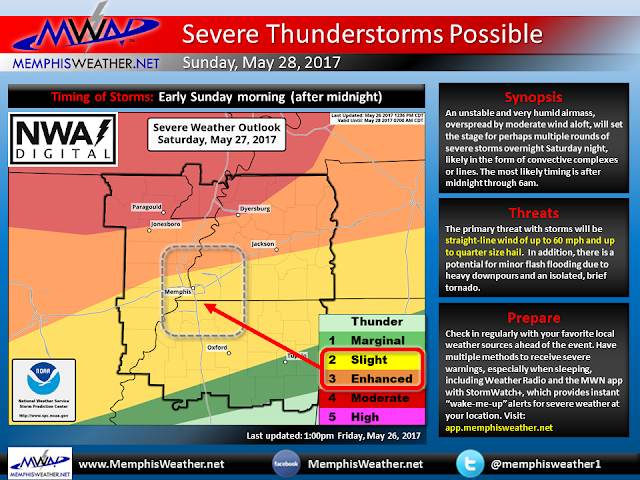 Our severe weather outlook graphic is shown below. Storms will have a higher probability of severe weather north and west of Memphis, but could still pack a punch as they move into the metro. Most overnight storm activity should be done by about daybreak Sunday, however lingering showers or a stray thunderstorm are possible early in the day. Planning to run the Memphis in May Great American River Race? Dress for warm, muggy conditions and scattered showers as well as a breeze! The cold front that brings storm chances to an end doesn't arrive until Sunday night, so we expect rejuvenation of scattered storms as the atmosphere heats back up Sunday afternoon and evening. The metro is under a Slight Risk once again for severe storms capable of hail or damaging wind. All outdoor activities need a "rain plan B" on Sunday. It will remain humid as well with highs in the lower 80s and breezy southwest wind. Rain chances diminish overnight Sunday night as the front moves through. 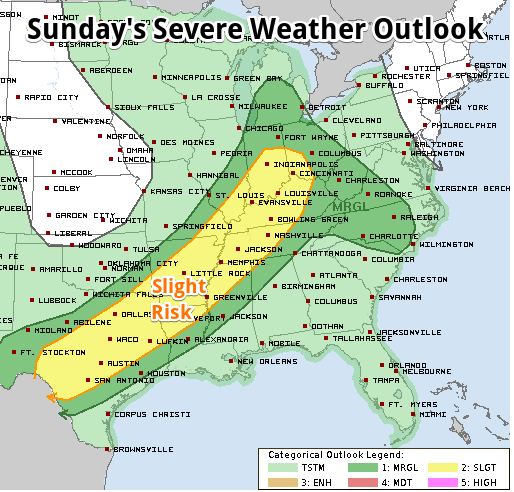 A Slight Risk of severe weather (category 2/5) exists Sunday as a cold front approaches by evening from the northwest. Storms are mainly possible during the PM hours with damaging wind and hail the main threats. The holiday itself actually looks pretty pleasant! Rain will be gone, though high clouds are still expected. Under partly sunny skies, humidity falls and highs reach the lower 80s (which will feel much more comfortable than Sunday's lower 80s due to more pleasant humidity levels). Tuesday also looks dry and warm with seasonal temperatures in the mid 80s. As we head into the middle to latter part of the week, a summer-like pattern takes hold with PM thunderstorm chances each day, highs in the mid 80s, and lows in the 60s. 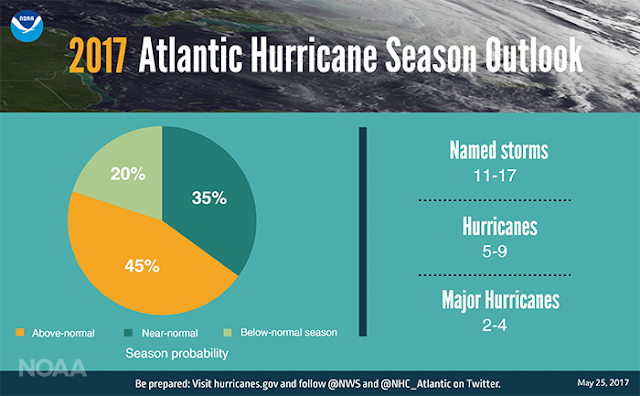 Yesterday, in conjunction with NOAA's Atlantic hurricane season forecast (more on that in a minute), the brand new (AMAZING!) geostationary satellite, GOES-16, was assigned a permanent spot over the eastern United States with full resolution of the western Atlantic and eastern U.S. It will go "operational" in it's new position in November if everything stays on track. Be sure to check out the first in a MWN Blog series on the technological "game-changer" satellite we published earlier this week. Stay weather aware this weekend and be sure you are following us on our social channels below, as well as have StormWatch+ set to wake you if necessary, and only in the most urgent cases, on Saturday night. 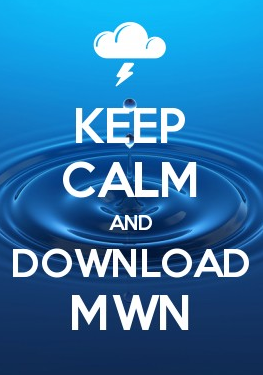 You can find it in the MWN app for iOS and Android. 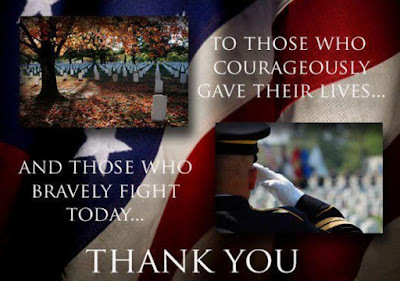 Links for more info and to download are below.